Like a fresh snowfall, the FTD® Winter Wishes™ Bouquet brings a quiet splendor to the occasion. 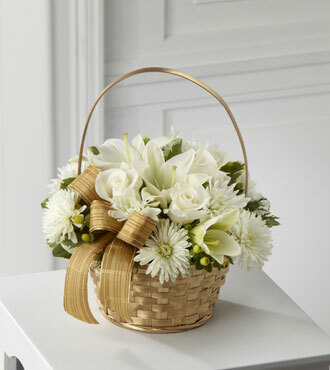 White roses, Asiatic lilies and chrysanthemums are nestled in a gold handled basket, highlighted with green hypericum berries and a golden ribbon. Capture the beauty of the season with this elegant fresh floral gift which includes your free personalized gift message.